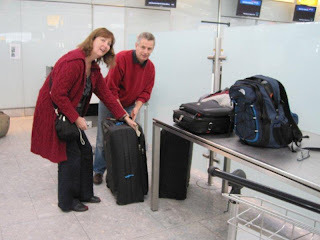 It took me many hours, and several attempts, to pack all the things I thought I would need for three months in Ghana – it will be interesting to see which gadgets and clothes I never wear or use. Although we were allowed 3 x 23k bags, I decided I would not be able to manage these at the airport and travelling within Ghana so restricted myself to two cases. 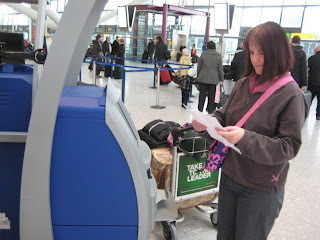 However, when we arrived at the airport and checked the weight of the bags, one was over by a few kilos. Fortunately, help was on hand in the shape of Janet and my brother Gerald. We decided to use the rucksack I had inside one of the cases and checked in a third bag after all! The security arch at the airport randomly selected me for a “pat down” search which I considered to be a little more than that! We flew with British Airways on a Boeing 777 and had the good fortune to be upgraded to Club World. The service was excellent and we had an opportunity to speak to both the cabin crew and the First Officer about the charitable work BA staff are involved with. This largely focuses on helping children in deprived communities across the world, but especially in Africa. At the airport in Accra we had a bit of a wait to clear immigration, and despite having a 3 month visa the immigration officer explained that she was only able to stamp our passport for 60 days and that we would have to go to an office to get it extended for another 30 days. Once we eventually reclaimed our bags, it was off to find our driver, Darlington. He was easily located near the exit. Darlington was taken aback by the amount of luggage we had until we explained we were staying in Ghana for three months and not just the 9 days in the villa. He said had he known he would have brought the bus! There was a throng of young men outside the airport all wanting to assist us with our luggage. Eventually, we relented and allowed them to help - this was a good decision as it was not easy to control the trolley on the steep access route to the car park. Once Darlington found a safe place to store the spare tyre what would not fit in the car with all our bags, we were off to the villa.